Compatible with Garmin Vivoactive HR Sports GPS Smart Watch ONLY, Not for other Models. 1. Soft, breathable, and lightweight Nylon sport band. You can wear it on any occasions, such as working, study, dating, sports, outdoor, shopping, etc. 2. Simple and easy to install and remove, tools included in the package. 3. 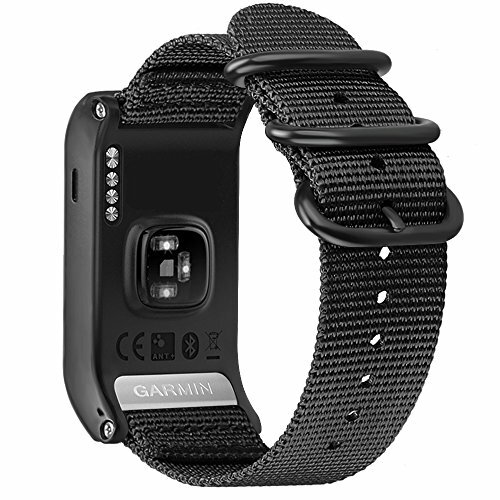 Easy to connect your Garmin Vivoactive HR watch snugly and securely. 4. Multiple alternative 10 holes for adjustable length. 5. Top Woven Nylon Watch Straps with stainless steel buckle, making fastening simply and securely, prevent loosen automatically. 2. Premium nylon material with moderate softness and fine craftwork make it comfortable to wear and durable. Lightweight & breathable and Skin-Friendly design. 3. Adjustable length design with 10 holes, the size of band can be freely adjusted, providing the best wearing experience. For small, medium, large wrists, fit 6.69" - 9.05" (170mm - 230mm). 4. Easy install and remove. Stainless steel buckle clasp with premium soft Woven Nylon combined to form a unique style. 5. Available in a lot of different colors, fitting perfectly your style and outfit. Match sports and leisure style with stylish and practical choice for men, women. Package include: 1 x Nylon Replacement Watch Band, 2 x Pin Removal Tools.